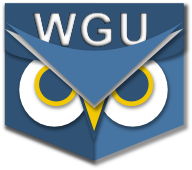 WGU changed the structure of the "Classic" portal this week so that students who haven't switched could start using the new format for Courses of Study (CoS). This is the format that "new style" portal users have had for a while now. PocketWGU versions before 1.8.6 will still try to access the "old" CoS format for students on the Classic portal, and this won't work. The new version fixes this problem. Also, for those of you who haven't upgraded to 1.8.5 yet, this version added a feature that allows you to create and save a "Progress Badge" within the app like the image below. Once created, the app will let you send the badge via email or post this badge directly to any social site (e.g. FaceBook, Google+, Twitter, Skype, etc.) for which you have installed an app. Note that the badge is saved onto your device, and not sent anywhere unless you choose to share it. Saving the badge to shared storage is the reason that versions 1.8.5+ now require permission to write to external storage on your device. Google Play calls this "USB storage", but its really saving the badge onto whatever SD card or general storage is on your device.